For the first time in three decades, the 2019 Oscars has begun without a host. Usually the show opens with a monologue about current events, politics and of course, the nominees. But instead, Adam Lambert and Queen opened the show with "We Will Rock You," then moved into another one of their hits, "We Are the Champions." It was a moment of true chills as Lambert sung the iconic words, "no time for losers" because "We are the champions of the world." The band had Bradley Cooper, Jennifer Lopez and others singing along and jamming out with them. The performance closed with a shot of the band's legendary former lead singer Freddie Mercury. "Welcome to the Oscars!" Lambert then shouted. 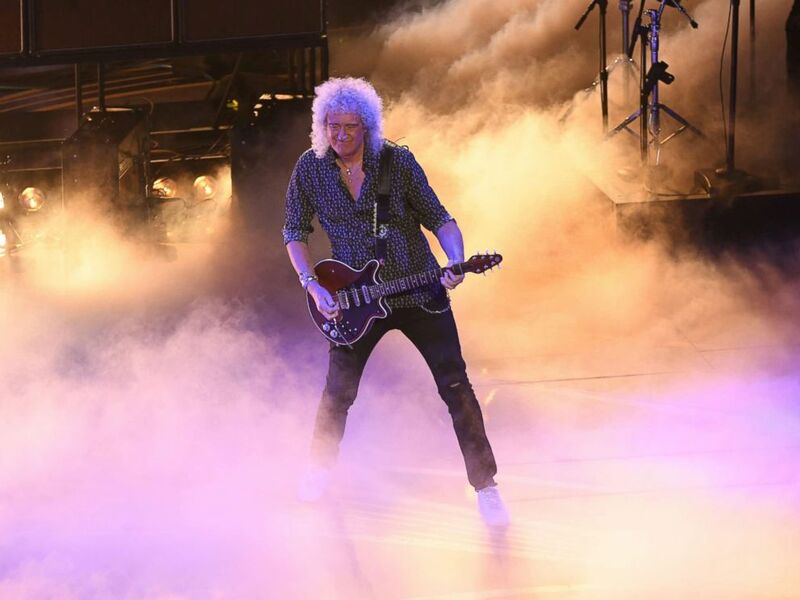 Brian May of Queen performs onstage during the 91st Annual Academy Awards at Dolby Theatre on Feb. 24, 2019 in Hollywood, Calif.
Next, there was a montage of some of the movies of 2018, including "The Favourite," "Deadpool 2," "Black Panther," "Roma," "Vice" and more. It closed with a voice-over from Mister Rogers from the acclaimed documentary, "Won't You Be My Neighbor." But the open was not done yet! 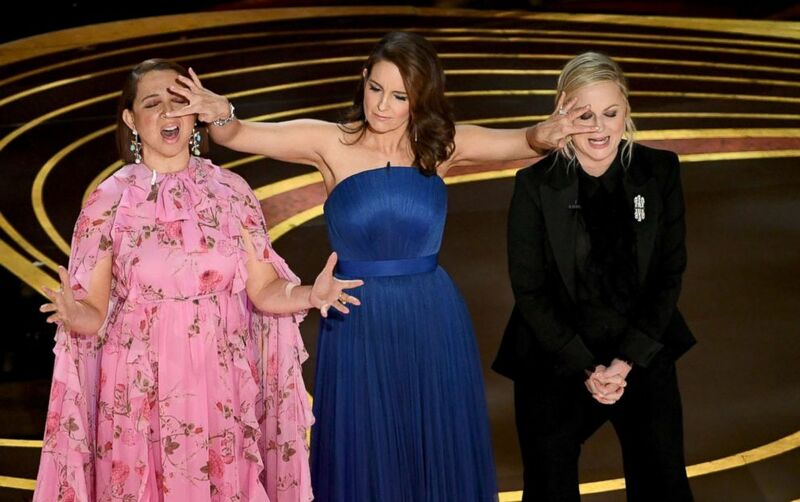 From left, Maya Rudolph, Tina Fey, and Amy Poehler speak onstage during the 91st Annual Academy Awards at Dolby Theatre, Feb. 24, 2019 in Hollywood, Calif.
A comedy dream team of Tina Fey, Amy Poehler and Maya Rudolph stepped out to present outstanding supporting actress. "We are not your hosts, but we are going to stand here a little too long," Tina Fey joked about the lack of an MC. "So, that the people who get USA Today tomorrow will think we have hosted." They gave a mini monologue like a host would have delivered (but instead with three hilarious women) with repeated jokes about not being the hosts for the night, on President Donald Trump's wall and even current events like the Fyre Festival, telling the audience to look under their seats for the infamous cheese sandwich from the failed music event. Then it was right into the nominees for best supporting actress. Poehler also said of the category that all women are supporting because "women naturally support each other." Kevin Hart had been named the host of the Oscars back in December, but the funnyman stepped down just hours later, after homophobic tweets he posted almost eight years ago resurfaced. Also in February, Hart's good friend Dwayne "The Rock" Johnson said he was offered the gig before Hart, but had to turn it down to shoot a movie. The last time the Oscars went without a host was 1989, when producer Allan Carr decided on having more presenters instead of an MC. That show had a kitschy open that featured actor Rob Lowe and Snow White singing a duet. It did not do well with fans and critics.